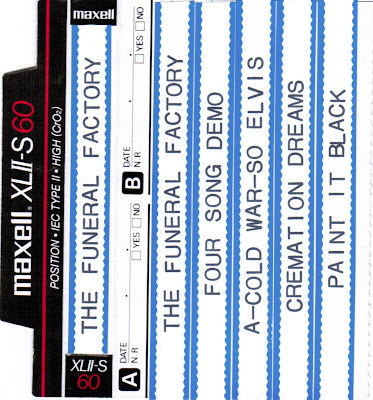 The Funeral Factory is a favourite among the downloads here at the CCPS, so when Grant Hutchinson offered up a copy of this, we couldn't say no. Grant did a fair amount of photography, design and video work for bands including the Funeral Factory and Tau Ceti, so it's not surprising that he had a small, but high quality cache of tapes to offer us.We're not sure of the year of this tape - but the recordings (with the exception of "Cold War") appear to be from the same as those from their 1990 tape (which Grant has provided us with an alternate j-card for - apparently the one we had wasn't the one that went to stores?). This perhaps serves as a nice distillation of the band. We're eager to get our hands any Funeral Factory-related clippings or info. If you have anything you can lend us, drop us a line.In the meantime, grab the demo here.